We're not just a nonprofit. We're the employee giving partner you've been searching for! 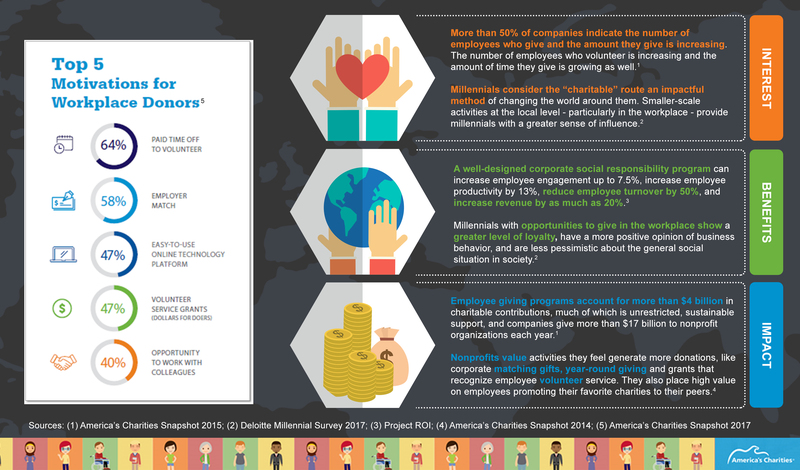 71% of employees say it is important to work for a company where giving and volunteering is supported. With America’s Charities’ range of employee giving technology and services, you can connect your team with the community and empower them to give where, when, and how they want. Which of our services and four technology options are best for your team? Please complete this form and our team will reach out to discuss your unique needs and identify the best fit for your company. In addition to the quality support your team will receive from our dedicated program success team, we also ensure your employee donors have a positive giving experience! Our multi-channel donor support has a 95% donor satisfaction rate.